So You Want To Be A Baker……? I recently had the pleasure of seeing yet another career transition client fulfill on their dream of creating or finding their dream job. Annemarie Spitznagle was a pharmaceutical sales executive who simply lost the passion for “schlepping” legal drugs. Instead, she wanted to pursue her true passion: organic foods including….sweets! Annemarie was well down the path of writing her business plan for an organic bakery prior to taking her Baker VocationVacation at The Pink Cupcake in Mt. Vernon, OH with mentors, Beth Murdock and Sommer Meade. She felt she needed the hands-on mentorship in addition to her coursework at the University of Wisconsin Center for Entrepreneurship. Combining class time with face-to-face mentorship is a key to success. Fast forward: In less than six months from taking her VocationVacation career mentorship, Annemarie opened her amazing, new organic bakery, Bloom Bake Shop, in Middleton, Wisconsin, a suburb of Madison. I asked Annemarie to share her advice and words of wisdom to those who think they may want to become a baker or become a bakery owner. Much of her sage advice can be applied to just about any other career transition, however. Embarking upon the path of career change and reinvention is not for the faint of heart. But it’s SO worth facing the struggle and obstacles to get to the point of work-life fulfillment as Annemarie has. Congratulations, Annemarie! So very proud of you….and all our other career transition clients who have created change and reinvented themselves. I can’t wait to enjoy one of your delish organic cupcakes! I’d tattoo my mantra between my eyes: “Remember it’s just cake!” It is so easy to get caught up and take it all too seriously. Find a theme song, bring it to work and play it when you are feeling stressed, tired, or just want to break out dance because you feel HAPPY because, darn it, you are living your dream! Tested my product with a constructive audience of strangers who owed me nothing and then tested it again!! And again!! If you haven’t worked in the type of bakery you want to own, go do it or apprentice in one. Experience first-hand the fun, the stress and the reality of it all. CNN Says I’m The Dream Job Matchmaker. Aw Shucks! Now, on a less serious note: Beard or No Beard? My family is split 50/50 on it. What do you think? You know, these days, some folks are forgetting to have fun in their work or job search (yes, job search can and SHOULD be fun at times). I feel there is a pervasive “heaviness” in the air due to the economic conditions in the US, the constant partisanship in DC, overall “worry” about world affairs and terrorism….and an increasing burn-out from those employed making up the hours for their laid-off colleagues who are equally burning out in their job search. Hence, people are simply tired. Let’s rid ourselves of this heaviness as best we can. What is my advice to all of you burned-out folks – regardless of whether you are employed or unemployed – to reduce your feeling of “heaviness”? Get out of your office or home office for a day or two and work remotely from a new and different locale. “I’m too busy with work,” you say? Take the work with you. Have laptop & mobile phone, will travel. This is the Internet/iPhone/Blackberry age for crying out loud! Work can be done just about anywhere. Any reasonable boss can be convinced of such (if your boss isn’t reasonable or rational, then you have another matter to address). You can take the work with you. No excuses! “I am unemployed and can’t afford to take a work vacation and leave town.” Fair enough. Then hop in the car, on the bus or subway and change your environment. Head to a coffee shop with WiFi in a completely different neighborhood, town or city within, say one hour, than you’re accustomed. No excuses! 1. Increased productivity and creativity – It is proven that when people shake things up a bit, they can actually increase the quality and quantity of their output by “clearing the mind”. No excuses! 2. Law of Diminishing Returns – as you burn the candle at both ends, the return on investment for your time decreases along with your productivity. By “getting out of there” and shaking things up, you will actually mitigate and maybe even eliminate the diminishing returns you’re creating for yourself. No excuses! 3. Fresh air – mind, body and soul. Now, I’m not a psychologist but it’s not rocket science to understand that seeing grass, snow, flowers, squirrels, trees, the blue sky and the sun is beneficial to your well-being. Get out of your cubicle for a day or two. Get out of your home office for a day or two. If you’re job searching, you can make phone calls from just about anyplace as long as it’s quiet…..and you can email resumes and network online via LinkedIn, et al from anywhere. No excuses! Do I practice what I preach? Absolutely. 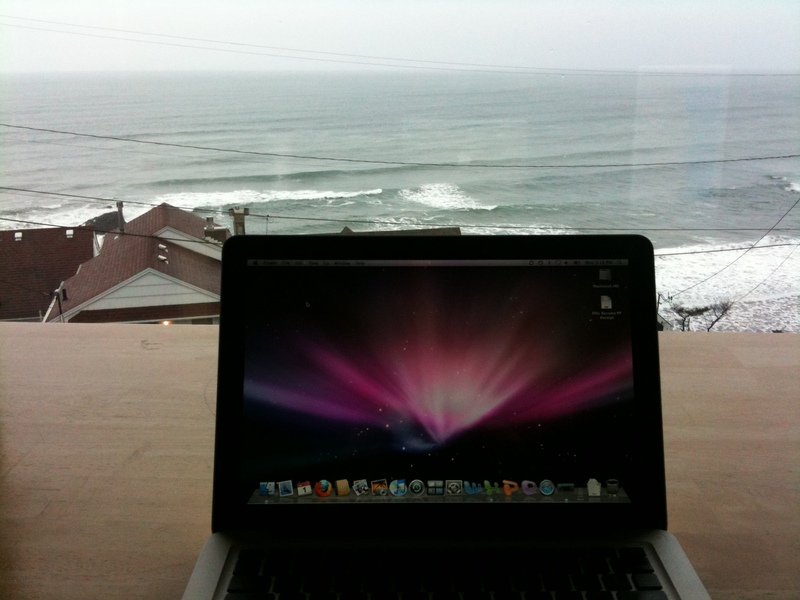 Here is a photo of my MacBook with a view of the Pacific coast in Lincoln City, Oregon just two weeks ago. Only two hours from Portland. Did I break the bank by getting away? Absolutely not. Getting away on a Monday and Tuesday during off-season is dirt cheap. Especially in this economy. And, again, if you can’t afford to actually get out of town for an overnight stay, then AT LEAST get out of your neighborhood, town and city and spend the day in a different neighborhood, town or city. Just for a day. No excuses! I promise you’ll see an increase in your productivity and creativity while feeling less burned out. And you’ll PHYSICALLY feel better. So, grab your iPhone, Blackberry, laptop, writing journal and whatever else you need to get the job or job search done and GET OUT OF THERE! No excuses.